The Daily Lives of High School Boys anime's new end theme was announced as Amesaki Annainin's "O-hi-sama" yesterday, following a minor scandal caused by the previously chosen band's bad attitude. 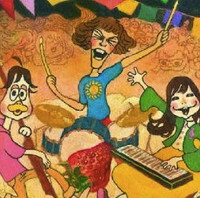 Jinkaku Radio was originally supposed to be doing the end theme, but a blog post from the band stating, "About that Daily Lives of High School Boys thing...the manga is actually pretty boring (lol)," caused major issues. They basically made fun of the project, but decided it might turn out ok since some of the staff is from Gintama. Following this, an apology was released and the band, their producers, and their record company self-punished by cancelling an in-store promotion that was planned for tomorrow, a Christmas Day performance in Shibuya, and the sale of their new single (which wasn't until February). They're also postponing the release of what was supposed to be next spring's new album. In the meantime, Amesaki Annainin's song "O-hi-sama" off their album Oishii Ongaku was chosen as the new end theme. It will go on sale as double single with "Yay!!" on February 22nd. The opening song is still Mix Speaker's Inc.'s "Shiny Tale." Daily Lives of High School Boys (subject matter self-explanatory) is based on Yasunobu Yamauchi's gag manga. The show premieres January 9th. VIDEO: Freddie Wong Spoofs Halo in "Master Grief"